A cursory glance at shop floors is all it takes to see human-robot collaboration has gone mainstream in manufacturing. However, a second glance reveals that this is more “to each his own” than “we&apos;re in this together.” Heavy-duty robots operate alongside their human coworkers without safety fencing, but direct interaction is a no-go. Safety precautions dictate that the robot freezes as soon as a human sets foot in a sizable sur-rounding safety zone. 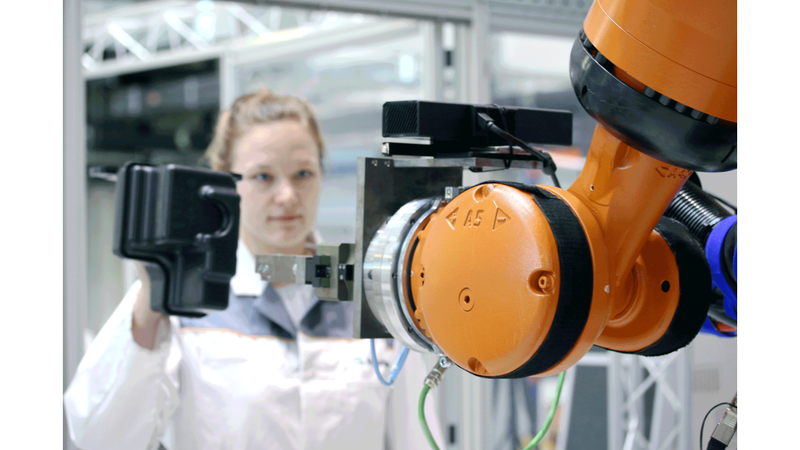 The Fraunhofer Institute for Machine Tools and Forming Technology IWU has come up with an unprecedented technology to make human-machine teamwork more efficient, benefiting the entire manufacturing workflow. This marks the first time humans can communicate and collaborate directly with heavy-duty robots based on hand gesture in the industry. This collaboration goes something like this on the shop floor: The machine recognizes human gestures, faces and postures when a person enters the robot’s work zone. This data serves to make the teamwork safe and to control the robot. The human simply gestures, using hands and arms to instruct the mechanized coworker to perform a task. Fraunhofer IWU is set to present this Innovation at the Hannover Messe in hall 17 at booth C24.